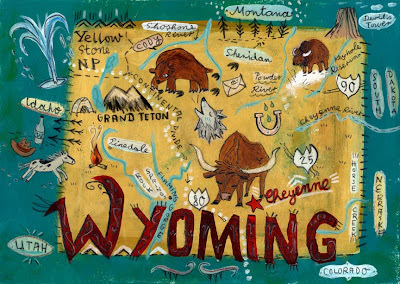 Christiane Engel - Scrapbook: Yeehaw Wyoming! The latest addition to my postcard set. How lovely! Wild Wooly Wonderful Wyoming... you simply must go there yourself someday! The thing is that 85% of it is a barren wasteland... and the other 15% is Yellowstone & other mountains. When we moved back to Seattle from New York, we packed everything into a big dodge pickup truck and drove it through Wyoming... over the Bighorn mountains. What a trip. lol! Lovely blogging... such a busy blogger! NY->Seattle? What a distance!! Must have taken ages. WY: yes, I have been there, all of the events are true though I do mix things and places up. 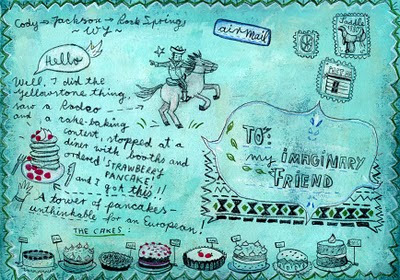 I plan to do these postcards for the states I've been to...just a few more to come. Would love to add the Deep South on this list, never been there! !